'Hello Sago' first season wrapped up! SIBY JEYYA January 8, 2019 12:00 IST 'Hello Sago' first season wrapped up! Sensuous beauty Shruti Haasan was last seen in Tamil in the action-packed mass masala entertainer Singam 3 aka SI 3 costarring the versatile hero Suriya and directed by Hari. The actress is currently acting with Vidyut Jammwal for a Hindi movie. 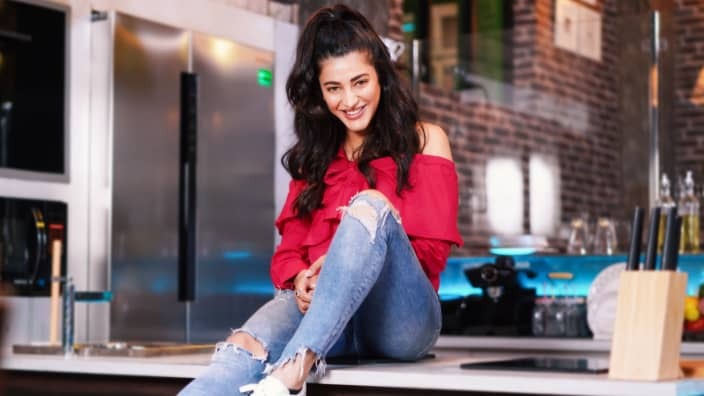 While her next Tamil flick Sabash Naidu has no signs of revival, last seen in Bollywood in Behen Hogi Teri, the actress got the opportunity to host the TV show, Hello Sago. She also hosted the show to perfection and it was an instant hit. Telecast on Sun TV, the show had received good TRP and had celebrity guests like KS Ravikumar, Meena, Shankar, Balaji Sakthivel, Nikki Galrani, Krish, Aishwarya Rajesh, Arunraja Kamaraj, and Yuvan Shankar Raja and Mirchi Shiva, and now, the actress has wrapped the shoot of the season 1 of the show, with an episode featuring her sister Akshara Haasan herself.